Just over 53 years ago, I arrived into the world and the doctor that was lucky enough to deliver me said four words that have shaped my entire existence ever since “Congratulations, it’s a boy”. As I’ve gone through life, changing from a boy to a man, I, like so many before me, have never actually stopped to think what that means. After all, we just accept that we are men, don’t we? But does anyone actually know what that means? What is a man, and how is a person a man? We don’t question we just accept. However, for some people, this is not as easy as it seems. A point that is expanded upon in Rhum and Clay’s production, Testosterone, currently running at London’s New Diorama Theatre. Using his own real life experiences, trans-man Kit Redstone, along with other cast members Daniel Jacob, Julian Spooner and Matthew Wells, talks directly to the audience about transitioning to being a man. Starting from his first testosterone injection, Kit’s journey goes through the physical side of transitioning, as people come to recognise that he is a man and react accordingly – that fabulous moment when he is called a geezer, along with various other names used by men about men – until the day when he uses the male changing room at a gym for the first time and really confronts masculinity in its purest form. And here is where the issues arise. Kit is a man, both mentally and physically but, not having been raised as a man, how does he obtain a masculine identity of his own? Testosterone really is a strong play that makes you stop, think and question. I could easily imagine that if we had stopped the play and asked all the men in the audience what it was to be a man, we would have received an almost infinite number of answers half of which would have been diametrically opposite to the other half. Even Wikipedia – which seemingly ‘knows everything’ – can only give the roughest of vague definitions of masculinity – a set of attributes, behaviours, and roles generally associated with boys and men. Masculinity is socially constructed but made up of both socially defined and biologically created factors – which tell you nothing. Although based on Kit’s own story, all of the cast were involved in devising the show and there must have been some interesting discussions amongst the four of them, and Director Julian Spooner, as they went through the various permutations of masculinity and produced around an hour of truly fantastic theatre. The cast worked in a tight but very effective set – designed by Alberta Jones – and the four of them really were fantastic. Whilst this is Kit’s story it is not a one-man show and the other three did a superb job of supporting Kit and being the various and variable people with whom he interacted on his journey. I’m also going to give a quick thumbs up for the music used during the performance, which worked really well to highlight the scenes and keep the story flowing. To be fair, any show that contains music from the “Jungle Book” – original cartoon not disastrous remake – is on to a winner for me; and King Louis’ song “I wanna be Like You” could not have been more apt for this show. If theatre is meant to give you food for thought then I had a five-course gourmet meal with wines, coffee and a glass of port to dine on after having seen Testosterone. There was humour, sadness, one amazing diva and a fascinating story without an ending as we stood with Kit, celebrating his triumphs and ending in the locker room facing and conquering his demons. Whilst by the end I’m not sure I could actually say I had a definitive answer to the what makes a man question, I had certainly learned a lot not only about myself as a man but also the male species as a whole. I also had some of my own beliefs about what it means to transition challenged and probably gained a greater understanding of the process than I had ever had before. 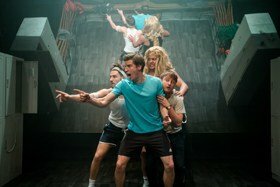 Testosterone is everything good theatre should be, powerful, emotional, entertaining and thought provoking and I cannot recommend it highly enough. One year after his first injection of testosterone trans man Kit is perceived completely as male. However, with this triumph comes a crisis of masculinity; What kind of man is he? Drawing on autobiographical experiences, TESTOSTERONE is the story of Kit’s first entrance into a male gym changing room at the age of 33. What first appears as a routine ritual of four men changing after a work out, then transforms into an epic coming of age quest for a masculine identity in an environment that affords little space to hide. Critically acclaimed Rhum and Clay (Hardboiled and 64 Squares) return with an explosive collaboration with theatre maker Kit Redstone and performer Daniel Jacob exploring everything that makes us who we are and what we want to be. Running Time: 70 Mins. Please note this performance contains flashing lights.